Typically inexpensive kits come with a generic potentiometer to control volume, maybe something like an Alpha or an Alps Blue Velvet if you're lucky. 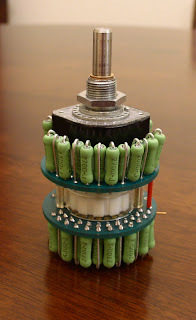 A potentiometer is basically a is a three terminal resistor with a sliding contact. In a typical amp, the input signal runs directly through it and it references the signal to ground at a percentage determined by how much the pot is turned one way or the other. Pots are made using a resistive element formed into a circular arc, and a sliding wiper traveling over the arc. The resistive element is usually made from carbon, cermet or graphite. If you skimp on the pot, you'll likely end up with something that may not be properly matched between left and right, you may experience static-like noise when turning it, and it likely won't sound all that great either. Really, a $14 Alps is the cheapest potentiometer I will go with on a normal-sized build. The Alps has it's own sound signature, and when compared to more expensive pots, you'll notice a nice difference. Many people swear by the TKD 2CP-2511 ($75), Noble AP25 ($25) and others; you really have to experiment to see where your preferences will lie. There's another class of products for those overly concerned with taking good care of the input signal attenuation called stepped attenuators. Stepped attenuators can be set up in a series, shunt or ladder configuration through a network of fixed resistors and a rotary switch. There's an excellent comparison between these three configurations on DIYAudio by Arn Roatcap, Inc. A series attenuator (the most common) is the cheapest and has the fewest parts, it uses all resistors up to a given point as the voltage divider. The problem is the resistor noise is added up, the more that are in the way of the signal. Series Attenuator - Image Copyright Arn Roatcap, Inc.
A ladder attenuator is in theory the best of the bunch, as it only uses two resistors at any one given time, this results in low resistor noise and good channel-to-channel signal level matching, it's the most expensive and largest of the bunch though. 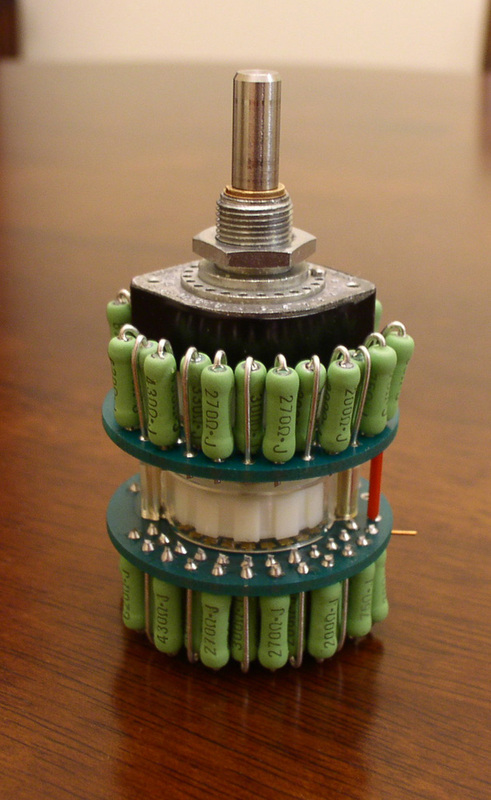 Ladder Attenuator - Image Copyright Arn Roatcap, Inc.
Then there is shunt style, which is a voltage divider that is formed with one single value resistor, and one additional resistor selected by the position of the rotary switch. This style will vary input impedance so it requires one to consider the equipment it will be used with to avoid overloading the input signal source equipment. 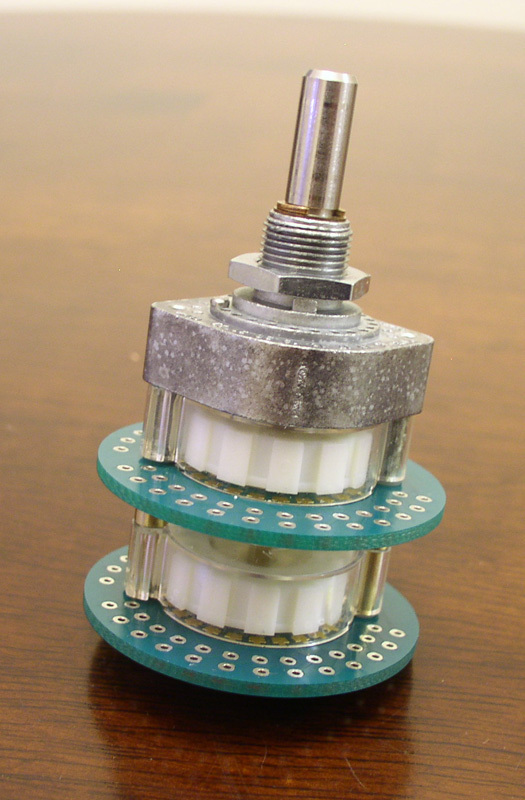 Shunt Attenuator - Image Copyright Arn Roatcap, Inc. 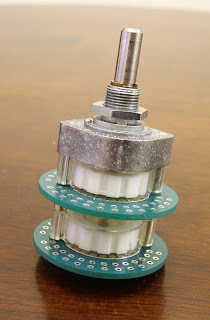 Typically, a series stepped attenuator can range anywhere from a $25 cheapie on eBay to several hundred dollars. Ladder steppers require many more resistors and boards so the cost increases higher still. Some companies that make attenuators are Goldpoint, Elma, Shallco, Glassware Audio, DACT and Seiden. Elma, Goldpoint and DACT all seem to make use of similar rotary switch mechanics and are closely priced. 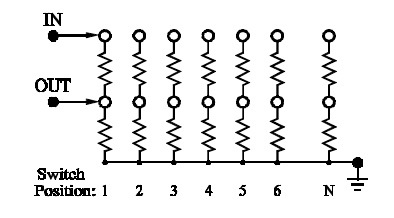 Resistors may be full sized through-hole resistors or SMC. You can get them with the resistors presoldered or you can choose your own by figuring out the logarithmic scale you'd like to follow and how many dB of attenuation you want between each step. There are programs to help you decide this on tonnesoftware.com and Glassware among others. You don't really save much money going this route, but you can choose your own flavor of resistor this way and you'll likely be a little more proud of your completed build. Please remember that building circuits and performing circuit modifications can be dangerous to you and/or your surroundings and should only be performed by a certified technician. The owner of this blog and all associated parties can not / will not be held responsible if you attempt a modification posted below and cause physical harm to yourself or your surroundings. Many electronics contain high voltages that can kill, and mods, if performed improperly, can be a fire hazard. Please keep this in mind. Goldpoint claims their series type attenuator with thin film,lazer trimmed resistors is clearer than a ladder type with the best resistors. Do you hav an opinion on that? Goldpoint is quite the expert in stepped attentuators, and they believe there is no real benefit to a ladder attenuator when using their thin film SMD resistors in a series attenuator. Indeed, using SMD resistors on a stepped attenuator can be beneficial by reducing the length of the signal path. If we want to split hairs, these thin film resistors are attached with solder to a PCB with signal traces, so the signal would have to travel in series through all these solder joints and signal traces probably on the average about 10-12 times for normal listening levels. Can the human ear hear the difference between 20-24 solder joints and 10-12 SMD resistors and two through-hole resistors and 4 solder joints? I'd imagine many of us would be hard pressed to pinpoint those differences.